While leaders at each ministry, institution, and department were preoccupied with election campaign by going in to their target areas ahead of commune election last week, the ordinary officials were required to attend political rallies during working time (It’s unofficial requirement but they suffered from their bosses’ pressure at workplace or they would not be promoted if those officers do not involve in political parties). They were not coming to work, at administration time, it affects working system which might be slow. But, the public healthcare service delivery is different from public administration service when the doctors are absent during campaigning administration time. Patients in the public health system are at higher risk of mistreatment or even death. On the other hand, generally, many medical doctors/midwifes/nurses (health officers) take advantage from their working place and/or supplementary at night time at health center or hospital, they go to work at their private clinics or work for another clinic. 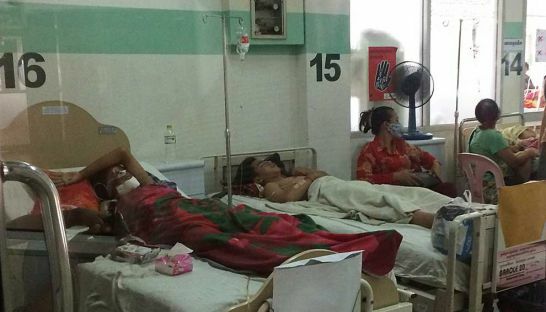 Patients in the public health system are also at higher risk of mistreatment or even death, Even the government tried to increase their salary for the medical officials but the doctor still does not regularly come to work at public health facility. There are two recent examples of the dangers of requiring doctors’ attendance at political events. The first case, a woman and baby died at National Maternal and Child Health Hospital called “Japan Hospital” which is a model hospital and in the second case, the mother unfortunately died, but the baby was saved at autonomous Calmette National Hospital. Both cases occurred during a week before the commune election on June 4. It’s horrifying that two women and an infant have needlessly died while in the care of the country’s best hospitals. Until now there is no formal technical medical statement about both cases from the Ministry of Health or the 2 national hospitals either Medical Council of Cambodia yet although the victims’ families, the husbands, have insisted. Both husbands claim that it is carelessness on behalf of the hospitals that caused the death of their wives. There were no specialized doctors or senior doctors on standby, and there were only junior doctors/midwife interns with less experience who did not take any responsibility for these events. Should the husbands’ allegations be true? It is really unprofessional: first, the doctors/midwives were helping to deliver the baby ran away, it is in violation of the ethical regulations regarding the medical profession: “Medical professionals shall absolutely not give up their professional performance in any form”. Medical officials must take the responsibility to help their patients until the patient’s last breath. Health care professionals should not flee when a patient dies. Medical officials must come to work in order to ensure things run smoothly. The method of the patient referral system: most of medical officials at the national hospitals are referral trainers, so when the patient’s condition is beyond the ability of the local health facility [health center and referral hospital], the medical officials must refer the patient to a higher level facility like the provincial referral hospital or national hospital. In case, Japan hospital, the poor patient has to be sent for emergency immediately to highest standard hospital. in the opposite is military hospital or behind autonomous Calmette hospital which has enough materials to save both mother and baby. In the second fatal case, the impoverished patient in Calmette hospital and it needed only the holder to take the patient to the emergency building so that they could be saved or the main doctors were not there because both victims’ families were too poor? How can people trust the public hospital if they are not guaranteed fair and high quality treatment? A lower mother mortality rate does not make rare deaths acceptable. The Ministry of Health has reformed the healthcare system better as well including the referral system, patient monitoring system, medical equipment, health information system; especially, the improvement of local health facility service delivery and the elimination of traditional birth attendants (TBAs); that led to decline of Mother Mortality Ratio from 472 out of 100,000 live births in 2005 to 170 out of 100,000 live births in 2014 significantly. Whereas Neonatal Mortality Rate also decreased from 28 to 18 out of 1,000 live births; 2005 to 2014 respectively (CDHS, 2014). Despite of the better reform, a major obstacle is still that the medical official uses the working time at public hospital to serve the private service and that greatly affects the whole health system. This doctor/midwife/nursery should divide clearly between the public and private service provision which is against Prokas in 2011 (ministry regulation) on Private Clinic Management. On article 29 of the Prokas says: “Only the doctor who has retired, left, or suspended his/her state service without pay with the acknowledgement of his/her department director may run a policlinic…”. Often Leaders and senior officials of Ministry of Health usually raised about the absence of medical officers working in the hospital or local health facility or being absent from their state workplace, but they instead standby at their private clinic or other private clinics, but they keep taking salary from the state. Therefore, the medical officers who like to take advantage from the state working time to serve or standby in private clinic feel not happy when the Ministry of Health launched the Decentralization and Decentralization reform (D&D) through pilot-test to transfer functions and human resource to sub-national administration to manage in three provinces (Phnom Penh, Battambang and Kampot provinces). In order to be transparent, the MoH should issue a technical medical statement regarding the deaths of these women and the infant. They should accept responsibility and investigate the circumstances. The Ministry should evaluate the healthcare service provision at both national hospitals to know whether the death of mother and baby caused by the disease or the discrimination of medical officers on the poor people? Which principle doctors had to take that shift on the incident day, please review it up again. Moreover, to strengthen health system delivery both national and sub-national levels, the government should reform the following three components: service delivery structure, service delivery capacity building, and incentives/special allowance for public medical officials. Lesson learnt from Thailand, public medical officers allow to open private clinic or working at private service, but they must standby at the public service in time and the public hospital has dormitory for doctors where inside or nearby their hospital. Generally, doctors was booked online if the patients want to make an appointment or to surgery in the private clinic (APO-Health System and Policy, 2015).